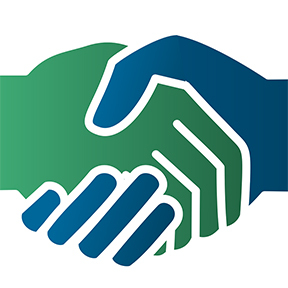 A number of wine tradespeople weighed in, with varied responses. It’s disheartening to see exchanges like this. But it happens all the time: wine professionals head to Italy for winery-funded trips and they head straight to wine country and then back to the airport without experiencing Italy’s immeasurable cultural treasure. In many cases, especially for young people, it’s their first trip to the country. It’s such a pity to see wine eclipse art, culture, and — in this case — one of Europe’s leading gastronomic destinations. It’s as if people like Levi, even with his vast knowledge of Italian viticulture, only saw a dichotomy and divide between wine and culture. In fact, wine is as much of a sine qua non of Italy as Italy is a sine qua non of wine. The one couldn’t exist without the other and vice versa. 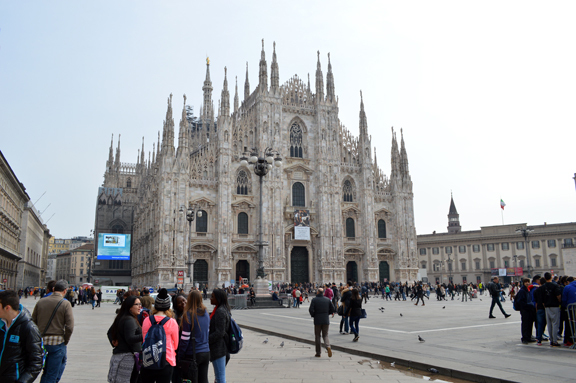 Above: the Duomo of Milan is certainly an “amazing” church but there’s a lot more to it than that. My recommendation to Vanessa was to dine at Pont de Ferr, a Michelin-starred restaurant in the city’s Navigli district (I wonder you’ve ever visited the area, Levi; if you have, you surely know that Milan is much more than just “art and amazing churches”). Milan teems with great restaurants, from the expensive Michelin-starred venues to the affordable trattoria (I like Antica Trattoria della Pesa). It’s also one of the best places in Italy — believe it or not — for Neapolitan and Pugliese seafood (because so many southerners live there). But there’s also so much more: the Teatro della Scala, the old Feltrinelli book shop on Via Manzoni, the shopping on Via Montenapoleone (not that I can afford it), the Pinacoteca di Brera (pinacoteca means art museum, in case you didn’t know, Levi), the Basilica di Sant’Ambrogio (another “amazing” church and one of my favorites)… I could go on and on. 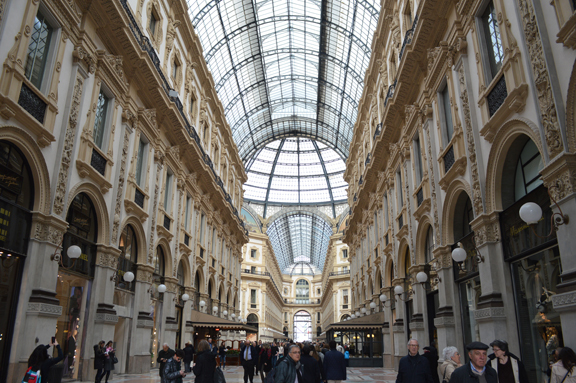 Milan is also the fashion capital of the world (not just Italy or Europe, Levi, the world!). Milan is also one of Italy’s major publishing hubs. As wine professionals, we mustn’t allow wine to elide art and culture. After all, humans could live without wine but humankind could not thrive without art and culture. Art and culture are the means by which we reflect on the nature of our existence. Wine is a beverage that sometimes tastes good and helps with digestion. “Being into wine” shouldn’t preclude “being into art and churches.” Knowing a little about those works of art and churches actually makes the experience of wine so much more meaningful than just tasting wine in a vacuum. So, please, please, please… the next time you head to Italy on a wine junket, take some time out to taste some art or an amazing church. Thanks for being such a good sport about this, Levi! I know what a thick skin you have! It being—-#1, my first time to Milan, and #2–the fact that I hadn’t had time to do my own research, I crowdsourced. I knew the stereotype–all fun & fashion, less substance than, say, Firenze (my frame of reference); I had been hoping there’d be a comment like yours to prove it wrong. Fifteen years ago I fell in love with wine. It fascinated me because it was a way to travel–college in Chicago was about as far from home as I’d gotten thus far. It was, and is, gateway to another language, way of life, food, an escape. Time to do my own due dilligence. Greengokitchen, thanks for the comment. It’s so unfortunate that stereotypes and common places blind people to what is so great about Italy. I walked all over Milan and reveled in every moment I’d turn a corner to see amazing architecture and the history it represented. But there came a moment when I simply had to sit down, order a doppio espresso, and admire all the sensationally pretty women. one crazy thing about Milan is how many handsome people you see there. It’s model heavy! Glad you are defending my home away from NYC. So much to do in Milan that is overlooked in addition to art, fashion, food and yes very attractive people. Anyone interested in Milan recs, happy to help. 10 years is a long time in that city and I have lots of tips to share.